Maui No Kai Oi Magazine is proud to announce the next Aipono Wine Dinner presented at Hali’imaile General Store on August 25th, 2018. Tickets are available online or by calling 808.572.2666. Throughout the year, the ʻAipono Winemaker’s Dinner Series brings the industry’s top winemakers to ʻAipono award-winning restaurants. $25 from each dinner goes to UH Maui College’s Culinary Arts Program, in addition, students apprentice under Maui’s top chefs to prepare the dinners. 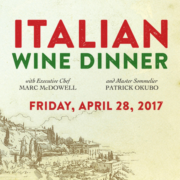 Tickets are $125 per guest with selected wine or $85 per guest for dinner only, plus tax and gratuity. Tickets are available online or by calling 808.572.2666. 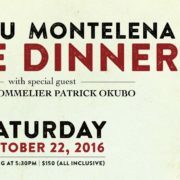 To purchase tickets for the dinner only, please call the restaurant. Below is a preview of the delicious menu!